What makes it special? : "Rags" was a failure when it opened on Broadway in the mid-'80s and since then it has been slightly revised from time to time. But for this production the show gets a major makeover with a largely new book by David Thompson ("The Scottsboro Boys"), many new lyrics by Stephen Schwartz and focused and fluid storytelling by director Rob Ruggiero. But why bother? : The score by composer Charles Strouse ("Annie," "Bye Bye Birdie," "Applause") and lyrics by Schwartz ("Pippin," "Wicked," "Godspell") are widely admired by theater fans.. And the theme of immigration to America at the turn of the last century would seem to be especially relevant to today. The title is an odd one: Yes but perhaps more apt for this production which really deals with the rag trade -- the garment industry. (And a much more evocative title than "Schmata: The Musical.") The show also pre-dates "Ragtime," the musical with a similar title taking place in a similar era nd touching on some of the same themes. What's it about? 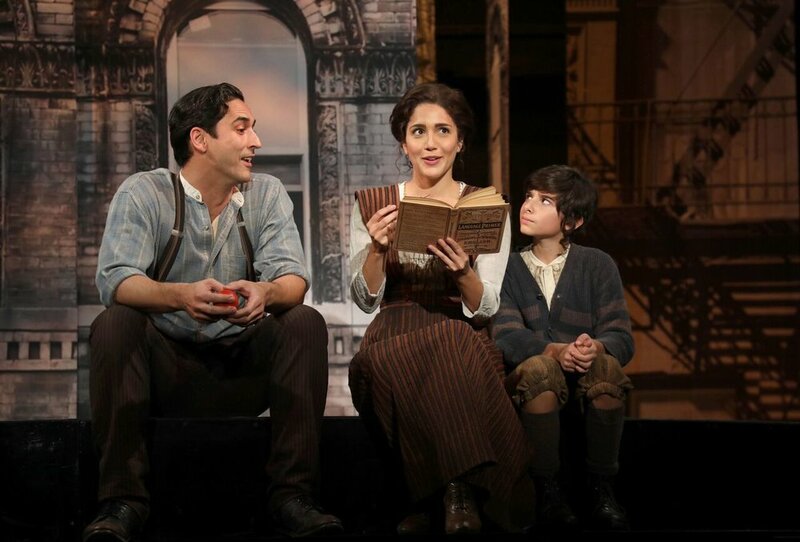 : Rebecca Hershkowitz (Samantha Massell), a new widow, arrives on Ellis Island penniless from Eastern Europe with her son David (Christian Michael Camporin). She is taken in by her new friend Bella Cohen (Sara Kapner) who is reunited with her devoted and educated father Avram (Adam Heller) already in the U.S., and trying his best in the peddler trade. They live in the tiny tenement flat of his sister Anna (Emily Zacharias) and her pessimistic husband Jack (Mitch Greenberg) and the family pitches in by doing piecemeal work at home sewing for the nearby garment factories. You're making that up: Nope. But "Rags"' librettist Joseph Stein -- who also wrote the libretto for "Fiddler" -- soon abandoned that idea for his own wholly imagined work. But there are definite echoes of that shared refugee journey still at the center of the show. And that same warm, gentle Jewish humor is also in evidence here. And beyond the tenement apartment? : Part of Rebecca's extended ad-hoc family includes a handsome Italian neighbor and union activist Sal (Sean MacLaughlin),; a young man Ben (Nathan Salstonre) who is a talented songwriter and who is also sweet on Bella; and a friendly merchant Rachel (Lori Winner) who has eyes on widower Avram. It's about the American Dream of creating a better life for yourself and your children and Rebecca aspires to be a dressmaker with her own shop, a dream Bella shares and encourages. When the owner of the dress-making factory, Max Bronfman (David Harris), sees Rebecca's extraordinary sewing and design talent, he tries to show her the path "uptown" -- with him. How is this production different from the original? : The Broadway production was a giant tapestry of immigrant tales that eventually weighed it down. It lacked focus though the diversions had their charms and interest. It had a more Ken Burns sweep. Rebecca sounds like a saint: She sort of is -- and it's all to the good that Thompson finally gives her ambition and temptations because the less generic "good" the better for this leading character. Massell has a glorious voice that does justice both to Strouse's score and Schwartz's telling and nimble lyrics. Giving the title song of the act one closer to Rebecca (instead of Bella) allows the leading character a transformative moment that gives her more complexity and conflict for the show's second half. Best songs? : "Brand New World" has that goosebumpy feel of excitement and hope; the anthem "Children of the Wind" -- teased throughout -- delivers at the end with a stirring scenic touch; "Blame It on a Summer Night" is a smokey, jazzy feel that shows off MacLaughlin's gorgeous baritone; "Three Sunny Rooms" is a charmer for Heller and Wilner; Harris is a smooth devil with the beguiling "Uptown." Even the uptown swells have an ear worm of a tune in "Greenhorns." Director Ruggiero makes you believe there's no shame to sentiment in a production if it's genuine and earned. It's reflected with countless moments by his fine cast: Avram's, concern, wit and grief (Heller, again outstanding); the fear, loneliness and finally cheek of a fatherless David in Camporin's just-right performance; Zacharias's simple faith as a low-key matriarch; Bella's brave optimism -- and great pipes, both reflected in Kapner's appealing performance; the seductive duet between Sal and Rebecca that could be the sexiest scene of the season with clothes on. Who will like it? Immigrants. Families of immigrants. Who won't? : Trump. Pence. Bannon. For the kids? : Yes. They'll identify with young David. Plus they should know the story of where they come from. What age? : How smart and mature are your kids? If they can understand basic American history and you've told them about your own family immigration to the U.S. -- unless they're Native American or were enslaved to come here -- then this musical is fundamental to their understanding of who they are. 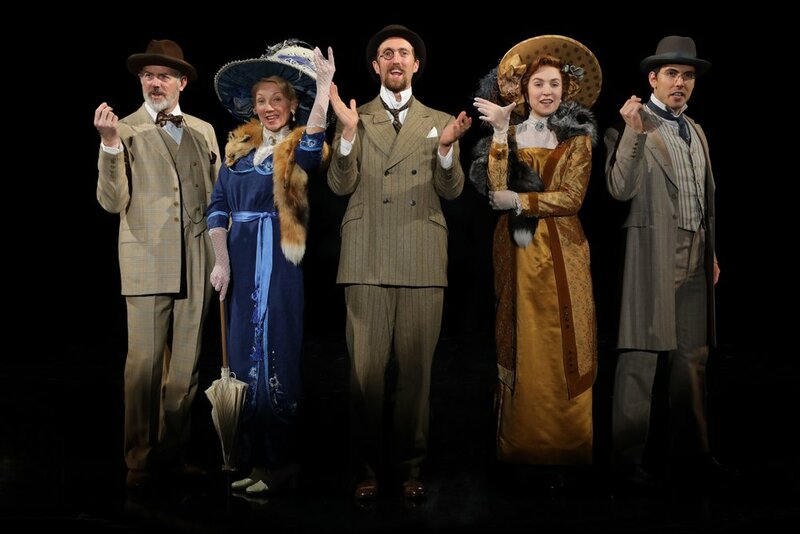 Twitter review in 140 characters or less: Handsome, intimate production of a stirring and tender story that connects to all of us with a splendid, tuneful and richly melodic score. Your heart will be filled. Bring your entire family to this one. Thoughts on leaving the parking lot: On the way home after the show I played the CD from the original production, a score and orchestrations I enjoyed -- esppecially the first half -- and I'm sure a reason why there are so many who have hopes for the show whenever it is revived. It sounds like an epic musical with a huge, lush sound. But I so much more prefer the scale of the Goodspeed production. Dan DeLange's orchestrations under the music direction of Michael O'Flaherty makes this version a human one while honoring the scope of the Strouse heartfelt score. And what did YOU think of the show? The basics: The show continues through Dec. 10 at the theater on 6 M Ain St., East Haddam, just over the bridge. Running time for the two act show is two hours and 35 minutes. Performances are Wednesday through Sundays. (Check listings.) Box office number is 860-873-8778 and www.goodspeed.org.